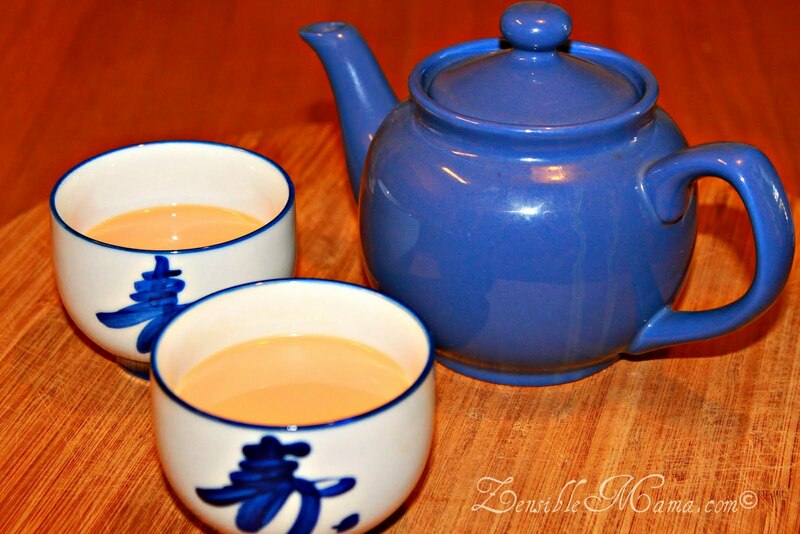 Chai Tea is one of my favorite comfort drinks especially when the weather gets cold. My only problem is, I couldn't seem to find the perfect blend around town. Not even Starbucks, Caribou or any other Cafes' I've been to have what I wanted. Most of them are either too sweet or the black tea isn't strong enough! The only time I was happy with this drink was when I had it in an Indian restaurant which unfortunately is not that close to me or I would have easily been the mayor of it on foursquare! So, to remedy my dilemma, I blended my own drink and yummo! I've been sinking ships eversince! Well, figuratively speaking that is. 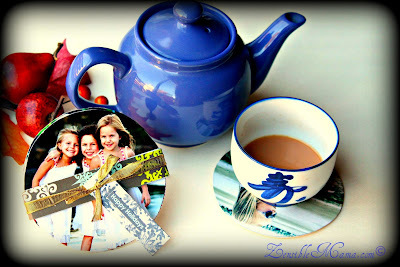 I also promised that I would share the recipe of this yummy Chai Tea which was featured in the photo op for my DIY Coasters project, so here it is! For your drinking pleasure! 2- Put desired amount of Loose Tea into your teapot. 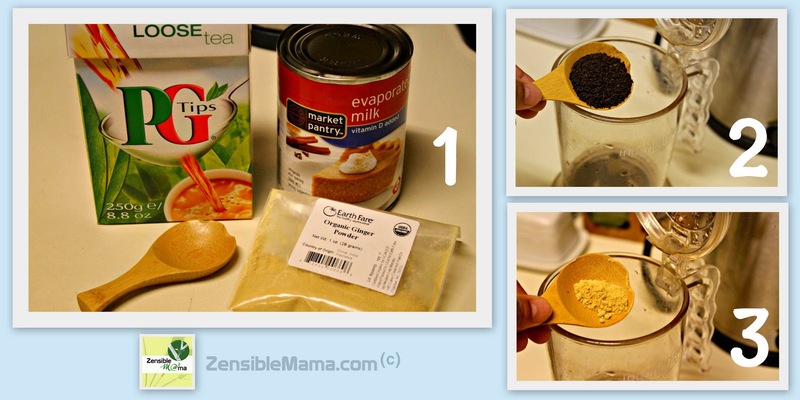 You can use 1 teaspoon per cup ratio. I used 2 tablespoon for this medium-sized infuser which is good for 2 1/2 cups. I also like my tea strong. Note: I use InginuiTEA teapot by Adagio Teas to steep my tea in. It makes transferring tea into mugs or in my case, in a traditional teapot without the grounds, so easily as you'll see in the picture below. 3- Add half a teaspoon of Ginger powder if you're making a batch good for 2 or more cups. Adjust your spice according to your taste. More ginger brings more warmth and kick to your blend. 4- Pour freshly boiled hot water and steep tea for 4 minutes. Long enough to infuse the loose leaves into the hot water. Note: If you're a tea drinker, I'd suggest investing on a UtiliTEA kettle by Adagio Teas. It's a hassle-free, no-brainer, nifty gadget to help you boil your water with the right temperature according to what type of tea you're going to steep. It has helped me make perfect Chai Teas every time I want some! 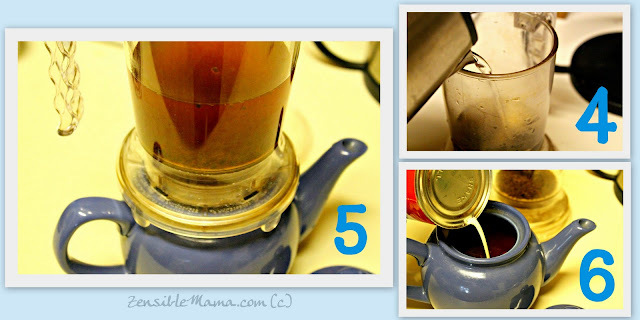 5- When steeping is done, immediately transfer tea directly to the teapot to preserve heat longer. 6- Mix in evaporated milk according to taste and voila! ENJOY your hot, comforting, yummy Chai Tea Zensible Mama style! Today is 11/11/11 let's drink Chai Tea to that! Do you like the Coasters pictured with the Chai Tea above? Well, those were made from repurposed Christmas cards. They were easy to make! If you want to see how it's made, click here: Coaster Tutorial and we'll take you there in a flash! You want to print this recipe? No problem! Just click on the share button below and search for print. You can do the same thing with all the tutorials too. This looks good! I once had Bedouin tea and that was amazing! I love Chai tea. And I like Starbucks Chai but you're right. It's hard to find strong tea. Here are a few things I've learned. My favorite Indian tea is Masala Chai. My husband did a great job of recreating it by actually brewing the tea in hot milk! I love Middle Eastern drinks. Everything there is bold in flavor especially their teas and coffees. I have yet to try that Bedouin tea Becca. If you like it spicy sweet, yup, Masala is a great spice in place of ginger Fadra.